Meet Alex Huey, a sophomore marketing major from Milford, Del. Alex is extremely involved on campus. When he’s not in class, you can probably find him playing trumpet for the UD marching and pep bands or tweeting about his adventures as a Blue Hen for the UD Social Media Ambassador program. Follow him on Twitter: @BlueHenAlexH. Alex is about to go on an adventure he won’t soon forget. 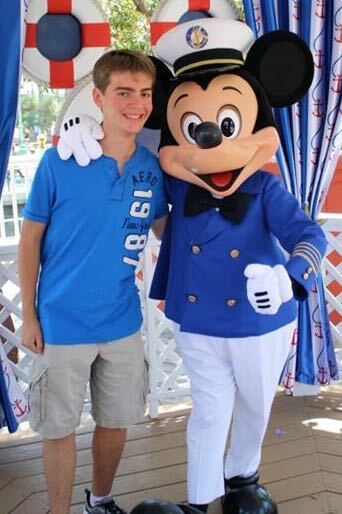 He’s off to Disney World as a member of the Disney College Program! Before he heads down south in just a few short weeks, we caught him for a quick interview so you can meet the Blue Hen we’ll be living vicariously through this spring. As he learns critical skills and develops as a professional, Alex will be blogging for us through it all. Read more about Alex in our interview below and then stay tuned for more updates starting in February! Us: What are you involved with on campus? Alex: I don’t like to sit still, so I do my best to keep involved on campus. I play the trumpet in the University of Delaware marching band in the fall, and also play trumpet in the UD pep band at basketball games in the winter and spring. Music has always been a big part of my life, and I wanted to continue with it at the college level. UD’s Marching Band program was one of the deciding factors when I chose to attend the University of Delaware. Outside of music, I’m also involved in Lutheran Campus Ministries, where I served as Treasurer. I’m also involved in the UD Social Media Ambassador program, where I tweet about my adventures as a BlueHen from a UD branded twitter account (BlueHenAlexH). Us: How did you hear about the Disney College Program? Alex: Being a big Disney fan, I’ve known about the college program for years. It was probably during my junior year of high school I really started taking the idea of doing the college program seriously. I’ve always wanted to work for Disney, and I knew that the college program was a great way of getting your foot in the door and begin networking. I really began planning my college program about a year ago. I knew that I wanted to do the program over a spring semester so it wouldn’t conflict with participating in marching band. I sat down with my parents and proposed my idea of taking a semester off to work at Disney and how it would benefit me professionally. I’ve always been lucky to have parents that support me in everything that I do, and they encouraged me to apply and chase my dream. Us: What was the application and interview process like? Alex: The interview process was simple, but long. It involved a lot of waiting. It started off with a web-based interview. The application opened for people wanting to participate in the Spring 2015 program in August of 2014. I filled out the application, and was emailed a web interview. As soon as you finish the web interview, you are immediately notified if you will move further in the interview process. A good number of people don’t move forward. Those that do are asked to schedule a phone interview with a college program representative. That interview was about two weeks after my web interview, and at a time that I set up online. I received my call from my recruiter, and we talked on the phone for about half an hour about how I felt I was a good fit for the Disney College program. My phone interview was the first week of September, and after a lot of waiting, I found out I was accepted into the program at the end of October. Us: Do you know what will be some of your day-to-day responsibilities? Alex: College Program participants are admitted into different lines of business within the company. Whether it be a role in attractions, merchandise, quick service food and beverage, or something else. I was selected for a role in quick service food and beverage. College Program participants don’t know exactly where they’ll be working until check in day, but it could be at any of the “quick service” restaurants at any of the theme parks or resorts on property, as well as, outdoor vending carts. I could be selling Mickey ice-cream bars, dole whip, or even work in a location such as the Be Our Guest restaurant at the Magic Kingdom. I’m sure I’ll love wherever I’m placed. No matter where I’m placed, I’ll be responsible for upholding the Disney quality of service, and making sure each of my guests needs are exceptionally met. Us: What are you most looking forward to about the experience? Alex: My personal goal each day is to put a smile on at least one person’s face. I like to think I’m a genuinely happy person, and love to share my happiness with others. At Disney, I have the opportunity to create magical moments and memories for guests. I’ve always dreamed of working for Disney, so I’m excited to get into the parks and be responsible for making the magic for guests. Us: What is your Twitter handle and/or blog link if people want to follow your day-by-day experiences? Alex: I am giving a go at blogging my college program experience, and I would love for people to follow along. You can keep connected to my blog at alexanderhuey.wordpress.com . (The blog is still not in its final form, but is coming together nicely.) I’ll still be tweeting as an SMA in Florida, and those interested in following my adventures can follow me: @BlueHenAlexH. Us: What is your favorite Disney movie? Alex: This is a tough question. Peter Pan was probably my favorite as a child, and is still one of my favorites today. I always been bit of a child at heart, and love the film’s spirit of adventure. The Jungle Book is easily a close second. Us: What is your favorite Disney quote? Us: What made you decide to apply for the program at Disney? Alex: I took a trip with my family to Disney World when I was in kindergarten, and then I was hooked. Its been 14 years since that trip to Disney, and little did my parents know that it would really have a lasting effect me. It was that trip that I first decided that I wanted to someday work for the company. I’ve always known that I wanted to make a career working for the mouse. This in mind, I know its very difficult to get a professional career with any of Disney’s businesses. They’re a very “In demand” employer. I knew I just needed to find a way to get my foot in the door, and the college program was a great way to do so. Disney likes for its employees in management positions to have experienced working front of the line jobs. George Kalogridis, the current president of the Walt Disney World Resort got his start with the company by bussing tables at the contemporary resort when it opened in 1971. The Vice President of Disney’s Hollywood Studios, Dan Cockerell, is alumni of the Disney College Program. Participating in the college program gives me the opportunity to network with people already working for the company. While the college program is considered an internship, it also opens the door for more professional internships with the company. Many of the professional internships in the Walt Disney Company require applicants to be Disney College Program alumni. The professional internship could be an marketing internship with ESPN or internship in the Walt Disney World public relations department. I do have plans with Disney in the long term. I’m really interested in Social Media marketing, and would love to work with the DisneyParks public relations teams. At the University of Delaware, I already participate in a Social Media Ambassador program. I’m planning on applying to work for the company professionally when I graduate, and I’m working hard to build a strong resume that Disney will take notice to. I’m hoping to have a long and successful career with Disney, and hope to one day be on the senior management team for Disney Parks. I had the pleasure of meeting George Kalogridis, the president of the Walt Disney World Resort, when I visited Disneyland a few years ago, and would love to one day hold that title as well. While in Disney, I’m not cutting ties to the University of Delaware. I may not be on campus for a semester, but I’ll be working with UD Career Services to blog my adventure through Disney, hopefully inspiring others through the process.